Why is it important for my child to see the dentist? You should take your child to see the dentist for their first check-up when they are three years old to check for proper development and functions. Most children have all of their baby teeth by age 3. There should be 20 baby teeth. The dentist can diagnose bad habits such as tongue thrusting and thumb sucking and intervene as needed to prevent long-term damage. Topical fluoride can be applied to help strengthen the teeth and fluoride supplements can be prescribed as necessary. An evaluation of oral hygiene can be made and ideas given to improve home care. 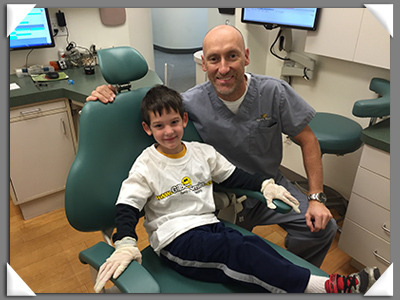 The first visit should be fun and non-invasive to encourage good oral health and prevent dental phobias. Baby teeth are thinner and need to have the cavities in them fixed early to prevent the infection from reaching the nerve of the tooth which could result in severe pain and the need for more extensive treatment or premature tooth loss. Does the office see your entire family so you have a good working and trusting relationship? Are the dentist and staff friendly and fun? Does the office cater to children and treat children on a regular basis? Look for things such as play areas, laughing gas, a toy box, free home care kits, and televisions to watch cartoons. Is the dentist available to treat emergencies? Can the dentist make a referral to a specialist for children with special needs? Does the dentist allow you to be present during the exam and treatment? Are all your question answered before and after your child is seen? Your child should brush twice daily for 2 minutes. Only use fluoridated toothpaste once your child learns to spit the toothpaste out instead of swallow it. Parents should assist younger children with brushing and supervise older children. If your child has a tooth knocked out or a piece of tooth broken off, place the tooth or piece of tooth in a container filled with milk and call your dentist immediately. Often times the piece can be bonded back on or the tooth can be re-implanted and stabilized. Only give your child water to drink in their bottle at night. Other liquids such as milk, juice, and soda can quickly lead to “baby bottle tooth decay”. It is often a good idea to place protective sealants on children’s teeth to help prevent cavities. In order to get a cavity, you must have three things: a tooth, certain cavity-causing bacteria, and sugar. Remember that even if your child doesn’t eat much candy or drink much soda but instead has fruit and juice, these contain natural sugars that must be removed from the teeth surfaces to prevent cavities. Baby teeth are important because they allow for proper functions including chewing and speaking during the child’s early years and also act as important “space holders” for the adult teeth which will replace them.